The Toyota Camry is one of the most boring cars on the road. How do you unboring it? You make it into a rally car with throwback graphics, knobby tires, fog lights, and turbos under the hood. If this doesn't win Toyota's Dream Build Challenge, then I might start losing faith in car nuts everywhere. Every year, Toyota gives cars to four teams of people before SEMA, and has them modify them however they see fit. This year there's an off-road Tundra, a 4-Runner for skiing, and something called a Crusher Corolla. 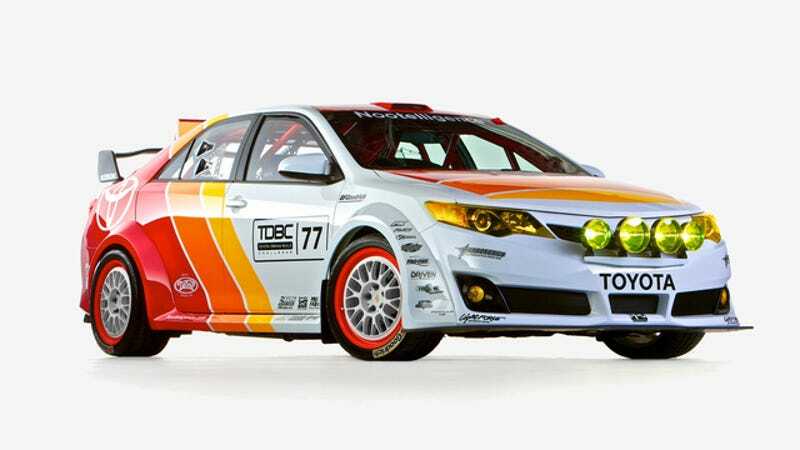 Then there's this, the Camry Rally Car, or CamRally, for short. It is, by far, the best car produced in this year's Toyota Dream Build. The car is the brainchild of NASCAR driver and possibly deranged obviously wonderful man Parker Kligerman. And yes, Parker is also a Jalopnik contributor, so perhaps you're thinking that makes us biased. Well, maybe it does, but do you see what this is? It's a gosh darn Camry Rally Car. Think about that. It's a Camry, which is the Kenmore fridge of the car world, done up in full rally regalia and it's actually functional. I love when a milquetoast car is taken out of its element and modified into something that it was never meant to be, this Camry does that perfectly. So what mods does it have? It's Toyota's V6 with some turbos on board and what seems to be an entirely custom exhaust (dig those dual center exits), custom Vogtland suspension, BF Goodrich rubber, rear deck wing, full roll cage, stripped interior, and custom graphics. All of this comes together to create a Camry better than basically any I've ever seen. Voting is now open on for the Dream Build. A vote for Parker's CamRally is a vote for freedom. A vote for America. A vote for apple pie. A vote for puppies and love. A vote for happiness. But most of all, it proves that if the right person has the right vision and modifies a car, it doesn't matter what they start with, because what they end up with will be spectacular. I'm talking to you, will.i.am. Vote for Parker's car here until November 4th. Do it.